During the golden age of album-oriented rock, when a Led Zeppelin double album could sell a million copies before its ship date, country music was for rednecks who wore manure-crusted boots to bed — or at least, that’s what the recording industry believed. But in 1975, Willie Nelson released an album that helped make country — and outlaw country at that — a national phenomenon. His masterpiece, Red Headed Stranger, tells a striking story of loss, sorrow, and redemption that resonated with the record-buying public. Not only is the music memorable, but the album cover art told a visual story long before anyone had ever heard of visual storytelling — which is why I have featured Red Headed Stranger in my series of posts on memorable album covers. After years of making other singers famous with his songwriting skills, Willie Nelson was starting to enjoy success as a solo artist when he recorded Red Headed Stranger. Based on the 1953 song “Red Headed Stranger” (written by Edith Lindeman and Carl Stutz), the album tells the story of a preacher on the run after he kills his unfaithful wife and her lover. The songs, a combination of covers and originals, are violent, beautiful, reflective, and romantic, as they relate different episodes in the preacher’s life as an outlaw. The album applied to country all the devices of album-oriented rock, which was at its apex: a cohesive theme, songs arranged in a thoughtful manner, and album art that complemented the music inside. Designed by Monica White (with art direction by Howard Fritzson), the album cover art not only molded Nelson in the image of an outlaw but also contributed to the rise of the entire country outlaw movement, which catapulted the careers of Nelson, Waylon Jennings, and Kris Kristofferson. For starters, there is the front cover, which consists of a drawn portrait of Nelson. With his piercing eyes, pitiless gaze, long hair, grizzled beard, and cowboy hat, he looks like a Wild West gunfighter who knows how to deal out rough justice. His name and the album title are rendered in an old-time script over a thick red border, as if branded on a fence post. In another panel drawing, the preacher accosts a would-be horse thief: he leans back and casually plants a bullet in the chest of the thief, a woman with blonde locks and a pink dress. But the back cover also contains a larger story arc, depicting the preacher dancing with a newfound love in one scene and relaxing at a riverbank in another. The episodes on the back of the album also contain song lyrics that go along with each scene — a clever approach that tells a story and advertises the songs. 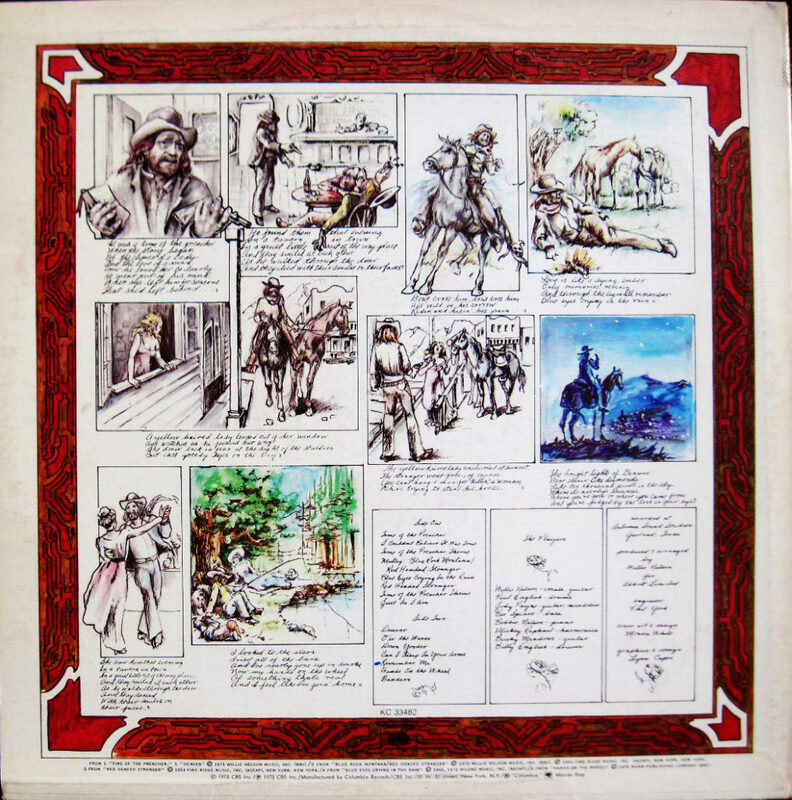 The front and back cover made a statement: Red Headed Stranger was not a typical contemporary country album but rather a journey to another time and place. And the album itself fulfilled the promise. Featuring little more than Nelson’s plaintive voice, a guitar, a mandolin, drums, and a harmonica, the music was a radical departure from the lush arrangements that typified country. 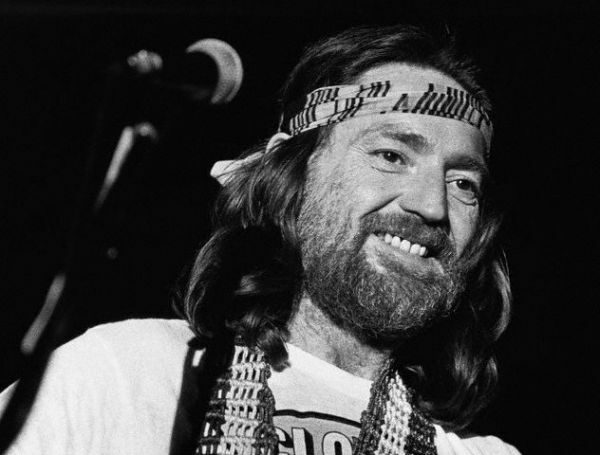 The songs themselves consisted of a collection of originals and covers, such as “Red Headed Stranger,” “Blue Eyes Crying in the Rain,” and “Hands on a Wheel,” which spanned a gamut of themes such as loss, remorse, and redemption — everything the album cover advertised, and more. 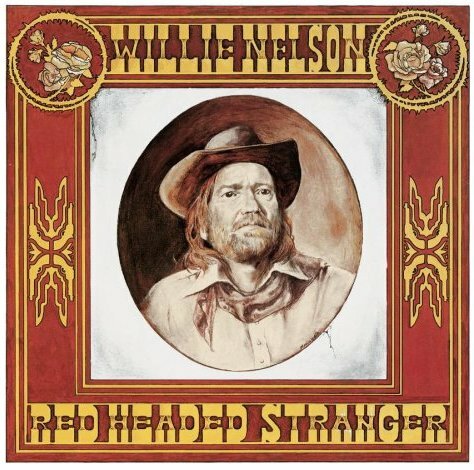 Once you heard those songs in one sitting, you understood the symbolism of Willie Nelson’s face on that album cover: Nelson wasn’t just channeling the Wild West; he had become the red headed stranger of his own songs, a moniker and mythology he would own for the rest of his career. Today visual storytelling is so important to image building that entire books are written on the topic. (The Power of Visual Storytelling, by Ekaterina Walter and Jessica Gioglio, is the visual storytelling Bible for brands.) Nearly 40 years ago, Red Headed Stranger set a high standard for visual storytelling — and changed an industry. Can Wu-Tang Clan Save the Record Album with “Once Upon a Time in Shaolin”? This entry was posted in Music and tagged David Deal, Howard Fritzson, Kris Kristofferson, Monica White, outlaw movement, Patrick Doyle, Red Headed Stranger, Rolling Stone, Superhype, Waylon Jennings, Willie Nelson. Bookmark the permalink.